August 23, 2017 August 23, 2017 Dan O.
U.S. soldiers Allan “Ize” Isaac (Aaron Taylor-Johnson) and Shane Matthews (John Cena) answer a distress call in the desert of postwar Iraq. Out of nowhere, gunshots erupt, leaving Shane badly injured and Allan with a bullet in his leg. 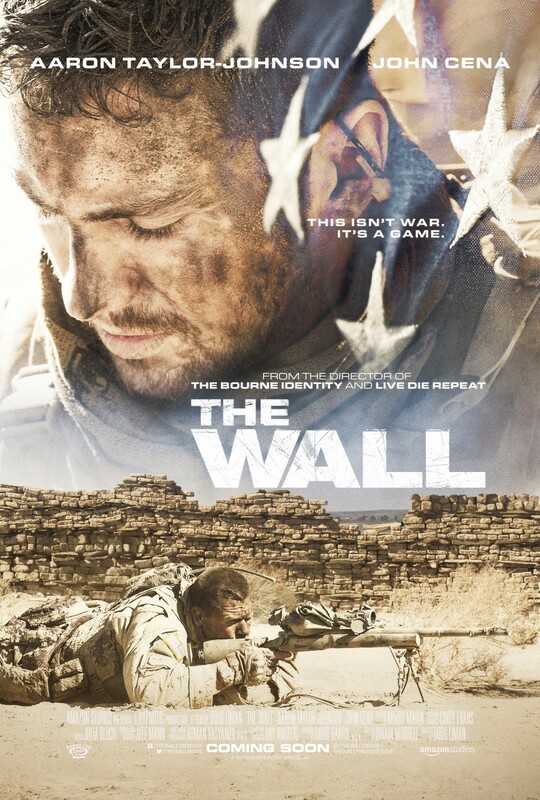 Forced to take cover behind a crumbling stone wall, Isaac now finds himself in a fight for survival against an unseen sniper who has all of the advantages. The Wall is one of those lean, mean, tight, and incredibly small thrillers that don’t get made as much as they probably should. See, most of Hollywood believes that the best way to achieve some chills and thrills, is solely through big, loud, explosions of action, CGI, and exposition that doesn’t really matter. It isn’t always the case, but for the most part, Hollywood has let the American thriller down and it’s up to folks like Dough Liman to try and save it. Lots of experience from COD. Unfortunately, the Wall isn’t quite the saving grace you could hope for. If anything, it’s a very small movie that flirts with the idea of being incredibly compelling and fun but, other than at least 20 or so minutes of actual intensity, the movie sort of just sits there and coasts by. It seems like, at any point, it’s going to take off and go somewhere crazy and relatively fun, but just as soon as that’s promised, for some reason, things slow back down. It’s weird, too, because you can tell that Liman wants it to take off of the ground – it’s just that he either doesn’t know where to go, what to do next, or basically, just didn’t have enough money to do the sorts of things he wanted to do. After all, Liman shot this whole thing practically on the sly, without anyone really knowing of its existence, nor what it was going to be about, which is a noble decision on the part of Liman’s, but it also may have taken the movie back a bit. The budget is smaller than most thrillers of this nature and because of that, some of the more ambitious things he may have been tempted to do, probably couldn’t have happened. And it’s not like I have issues with small movies such as this, just sitting in one location for the whole run-time, but that’s literally what happens in the Wall for at least half of its hour-20 run-time: Sits. The only aspect of the movie that makes it all worth saving and sticking around for is Aaron Taylor-Johnson in the lead role. Wait. Why is there a picture of air? And I think it should be stated by now, people, that Taylor-Johnson is a pretty great actor. Sure, he’s a hunk, a pretty-boy, and most definitely the crush of every girl out there who has ever laid their eyes on him, but all that aside, the guy can handle any role put at him. His role here finds him doing a lot of heavy-lifting all by himself, without much assistance from those around him, and it deserves to be noted that he makes it all interesting to watch. We don’t get much background about his character, other than the fact that he’s a soldier and loves America, but Taylor-Johnson gives us the promise that there’s something more there, just waiting to be revealed; add that to the fact that he’s a soldier, trapped in a deadly-position, without much of a way out, and yeah, he’s awfully sympathetic. Which is why the Wall, though it doesn’t really get as deep as it probably should have, definitely seems like the kind of movie that wants to say something about war, the military, or even foreign affairs, but at the same time, sort of only skirts by all of these ideas it probably had brewing in its mind. The Iraqi soldier speaking on the radio the whole movie, constantly reminds us, the audience, about the United States and their constant insistence on getting involved with other country’s business and while it is no doubt a true and honest sentiment, it’s told to us through someone who is, either nonexistent, or basically, just a victim. There’s not much else to him, so because of that, we’re sort of just left with the idea that he’s a sick human being who wants to see soldiers killed, because, well, why not. May be a case of me nitpicking, but I don’t know. At least some of those mainstream, Hollywood, big-budget thrillers have a little bit more on their mind than just shooting, blood, action, violence, and xenophobia. Consensus: Even with a solid lead performance from Taylor-Johnson and a few solid thrills, the Wall crumbles under the weight of its own rather small ambitions and, of course, budget. Hurry, Aaron! Save that air!